Famed for its simplicity and directness, Parting from the Four Attachments is one of the most prized teachings of the Sakya tradition. To introduce this system of practising meditation, Lama Jampa will teach Sakya Pandita's especially powerful condensed form of the teaching. This teaching is suitable for both beginners and experienced practitioners. For further details please see the local website. Public lecture - Is Buddhism a Religion? Lama Jampa Thaye will give a public lecture suitable for anyone with an interest in Buddhism. This text is the key manual of study and practice in the Kagyu tradition. It gives a complete explanation of the Buddhist path from its starting point to the achievement of enlightenment, and is relevant to anyone who has a serious interest in Buddhism. Buddha nature, precious human life, impermanence, karma, suffering, loving kindness, compassion and the six perfections are among the topics covered in the Jewel Ornament of Liberation. Gampopa (1074 - 1153CE) was the principal student of the great yogin Milarepa and is one of the most highly revered Tibetan Buddhist masters. Lama Jampa will give two days of general dharma teachings. Details to be confirmed. Also known as The Jewel Rosary, The Precious Rosary of the Supreme Path by the great Kagyu master Gampopa, is a treasury of advice on practising genuine dharma. It unifies the two streams of spiritual instructions that descended from the early Kadam tradition and the Mahamudra lineage of Indian and Tibetan masters. This teaching will be the third part of the text begun in Harrogate in September 2018. This important text by Konchok Lundrub (1497 - 1547) is an explanation of the first part of Lamdre, the path and its fruit. "For those fortunate practitioners who want to achieve liberation, this text is like a staircase, an excellent medicine which eliminates the suffering of living beings, and a valuable object which surpasses even the wish-granting jewel." This celebrated text by Chogyal Phagpa was composed as a manual of instructions for the 13th century Mongol Prince Gibek Timur. In 204 verses it covers the entire Buddhist path, from the level of a beginner to that of full enlightenment. The first part of the teaching provides guidance for a good life; the second one outlines the path for liberation and the final major section - the distinctive features of the Mahayana path. The text is beautifully written which makes it especially accessible. Lama Jampa will give an introductory talk to the main course in nearby Vignolla . What is meant by wisdom? How does real compassion express itself? What is called voidness in Buddhist terminology and what are the clever means on our path? Lama Jampa Thaye will explore these questions and in particular question and deepen our understanding of the Four Limitless Meditations. For further information please visit the local website. Ganapati is a key Vajrayana wealth deity. Receiving such initiations and the instructions for practice contained in them empowers us to bring about the supportive and harmonious conditions so important for progress in dharma. This particular lineage of Ganapati was brought to Tibet by this he great master Atisha and preserved in the Kadam and Sakya traditions. The Jewel Ornament of Liberation by Gampopa is the key manual of study and practice in the Kagyu tradition. It gives a complete explanation of the Buddhist path from its starting point to the achievement of enlightenment, and is relevant to anyone who has a serious interest in Buddhism. Buddha nature, precious human life, impermanence, karma, suffering, loving kindness, compassion and the six perfections are among the topics covered in the Jewel Ornament of Liberation. The event on 1 and 2 December will cover the second part of this major text. The teaching will continue in July 2019. For schedule and booking information see the centre's website. This brilliant text of the renowned scholar Sonam Tsemo (1141-1182) is for the best of the dharma students - those who want to master the dharma in its entirety and who have the curiosity to learn the details in the teachings to such an extent that their confidence in Vajrayana becomes unshakable. The text is like a treasure grove in which the detailed refutation of the wrong views, done almost with a surgical precision, is interwoven with an extraordinary inspiring description of the teachings and origins of the tantras . For booking and further details please visit the local website. What are the roots of authentic compassion? Lama Jampa will teach from the rich treasury of Buddhist thought and also lead sessions of meditation on love and compassion. For full details and booking please see the local website. In this first week Lama Jampa will teach from his forthcoming work ‘Patterns in Emptiness: understanding dependent origination’. As His Holiness Karmapa says in His forward, ‘This is the heart of the Buddha’s teachings.’ In this course Lama Jampa will show how it is to be approached in all three vehicles. Alongside this teaching Lama Jampa will bestow the initiation of ‘Tara Who Liberates from all Fears’ and lead daily sessions of her meditation. The second week provides an extremely rare opportunity to receive the system of meditation of Chenrezi from the lineage of the Tibetan siddha Tsembupa. Tsembupa was an 11th century master who obtained this teaching directly from the goddess Vajrayogini. Accompanying the transmission Lama Jampa will bestow the initiations of Chenrezi and Vajrasattva, the transmission of Phowa and instructions on the bardo. This teaching will be the third part of the text following on from the first part taught in Harrogate in September 2018 and the second part taught in Hebden Bridge in May 2019. Lama Jampa will continue with teachings on the Buddhist view of the ultimate nature of reality using this famous guide to the Great Madhyamaka composed by the nineteenth century master of the Rime movement, Jamgon Kongtrul Lodro Thaye. This essential text by the Master Jamgön Kongtrul Lodrö Thaye (19th century) sheds light on the perspective of the Kagyü tradition's most influential Zhentong Middle Way philosophy (Madhyamaka). In it, the author does not impart a merely theoretical approach, but offers a real manual with practical instructions for meditation in the context of this special perspective of the "Empty of Other" perspective (Zhentong), which represents the interface between the Sutra transmission and the Vajrayana. These are the precious instructions that directly connect the mahamudra teachings with the teachings of the Buddha-nature. For further details see the local website. Namgyalma (Ushnishavijaya in Sanskrit) is one of the three main Buddhist deities of longevity, along with White Tara and Amitayus. She is also associated with the development of transcendental wisdom. Revering and meditation on Namgyalma grants both mundane and transcendental siddhis. The most important of her mundane accomplishments is preserving and strengthening life energy, the granting of long life. Her profound siddhi is the swift accomplishment of transcendental wisdom. This is a rare opportunity to receive the extraordinary teachings of the Moon River Flow White Tara. This system of practice is the principal Vajrayana means of achieving longevity. The course will begin with the initiation and tri (instruction) of White Tara by Ngawang Legpa. * In order to attend this teaching you must have made a formal commitment to the Buddhist path through taking refuge. If you would like to take refuge beforehand please contact the centre. Chenrezi is revered in all traditions of Buddhism as the supreme embodiment of enlightened compassion. This initiation bestows the authority to meditate on Chenrezi. It is one of the most widespread meditation practices in Vajrayana Buddhism. This transmission will enable one to practice the sadhana of Padmasambhava Guru Yoga if recommended to do so by one’s Lama. *Please note that in order to attend these teachings one must have made a formal commitment to the Buddhist path through the act of taking refuge. Please contact the centre for further information. In this session Lama Jampa will talk about the path of Vajrayana Buddhism, in particular explaining the method and purpose of receiving initiations and the type and stages of practice that this enables us to engage in. For further details please see the local website . The system of meditation practice known as mind training (LOBJONG in Tibetan) is one of the most popular and widely-practised in Buddhism. Geshe Langri Thangpa’s work is one of the most celebrated spiritual teachings in Tibetan Buddhism. It offers us a method of transforming adverse circumstances into positive aspects of the path of awakening compassion. In this talk Lama Jampa will explain how we can awaken our innate qualities of clarity and kindness, by turning away from our clinging to distraction and habitual patterns of mind. By gradually training in detachment from materialism, people, power and the other myriad ways our ego seeks to comfort and magnify itself, we can clear away the confusion and awaken to true wisdom and natural kindness and compassion. In Buddhism we call this taking refuge – choosing a virtuous path for the benefit of ourselves and ultimately all sentient beings. For information please visit the local website. In connection with his forthcoming book ‘Patterns in Emptiness’ Lama Jampa will reference texts from across the Buddhist canon in order elucidate the teachings on emptiness and interdependent origination. ‘All phenomena have an existence on a relative level but according to Buddhism are devoid of existence proper to the ultimate level. This is called the emptiness of phenomena. This reality is extremely difficult to achieve, but it is only this that determines our access to liberation from the cycle of rebirths. This emptiness, however, is not a nothingness, it only defines what does not exist: an existence in itself. See the local website for further information. These three short texts drawn from the famous collection known as 'One Hundred teachings of Mind Training' present extraordinary instructions for developing wisdom and compassion. With an unparalleled directness, they allow us to transform all situations, positive and negative, into the path of awakening. Saraswati is famous as one of the principal wisdom deities in Vajrayana Buddhism and as a patroness of poetry and music. Thus many great masters have cultivated her meditation for the many qualities that it bestows. Lama Jampa will give the initiation of White Saraswati from the Bodong lineage. This is an explanation of Gampopa’s four-line teaching which provides an overview of the path of mixed sutra and tantra. It begins with contemplation of the four thoughts, progresses through the preliminary, development and completion practices of Vajrayana, and culminates in Mahamudra and Dzokchen, the supreme meditations of the Kagyu and Nyingma schools of Tibetan Buddhism. Lama Jampa Thaye will explain the Buddhist perspective on emotions based on his academic and meditative background. For full details please see the Valencia Bodhi Path website. His color is a bright lapis lazuli blue. The left hand is in the meditation mudra and holding a begging bowl. The right one is in the mudra of giving and holding a myrobalan plant (Arura). His practice heals the suffering of the disease whose root cause is greed, hatred and delusion. *Please note that in order to attend this teaching you must have made a formal commitment to the Buddhist path through the act of taking refuge. Please contact the centre if you would like to take refuge with Lama Jampa before the teaching. In 2019 Lama Jampa will continue with his teaching and transmission of this important text, which is an explanation of the first part of Lamdre, the path and its fruit. This next part covers the development and practice of loving kindness and compassion in Buddhism. Public lecture - Why do we Meditate? In this evening lecture Lama Jampa will explain the basics and benefits of meditation. For full details please see the local website. Attendance at the initiation is a prerequisite for receiving these teachings in the afternoon. For further information please see the local website. The event on 1 and 2 December will cover the first part of this major text. The teaching will continue in 2019. The initiation of Chenrezi from the Chikshe Kundrol. These three short texts drawn from the famous collection known as 'One Hundred teachings of Mind Training' present extraordinary instructions for developing wisdom and compassion. With an unparallelled directness, they allow us to transform all situations, positive and negative, into the path of awakening. Lama Jampa will give teachings on the Buddhist view of the ultimate nature of reality using this famous guide to the Great Madhyamaka composed by the nineteenth century master of the Rime movement, Jamgon Kongtrul Lodro Thaye. The system of meditation practice known as mind training (LOJONG in Tibetan) is one of the most popular and widely-practised in Buddhism. Geshe Langri Thangpa’s work is one of the most celebrated spiritual teachings in Tibetan Buddhism. It offers us a method of transforming adverse circumstances into positive aspects of the path of awakening compassion. Manjushri is the supreme embodiment of wisdom in Buddhism. For this reason his meditation is undertaken by those who seek to develop a profound understanding of the teaching. Please note that in order to receive this initiation on must have made a formal commitment to the Buddhist path through Taking Refuge. If you would like to take refuge before the initiation please contact info@dechen.london. The Four Dharmas of Gampopa is an explanation of Gampopa’s four-line teaching which provides an overview of the path of mixed sutra and tantra. It begins with contemplation of the four thoughts, progresses through the preliminary, development and completion practices of Vajrayana, and culminates in Mahamudra and Dzokchen, the supreme meditations of the Kagyu and Nyingma schools of Tibetan Buddhism. The way to enlightenment in Mahayana Buddhism proceeds through a step by step development of compassion and insight. In his guide the great master, Thokme Zangpo, provides us with an indispensable set of instructions for this gradual path. For schedule and further information see the centre's website. Lama Jampa will give teachings on Parting from the Four Attachments using the commentary by Nubkyi Rigzin Drak. This teaching is an excellent introduction to the graduated path of meditation, accessible to both the beginner and the more experienced alike. A special feature of this text is the manner in which the system of Parting from the Four Attachments is interwoven with that of the Four Dharmas. 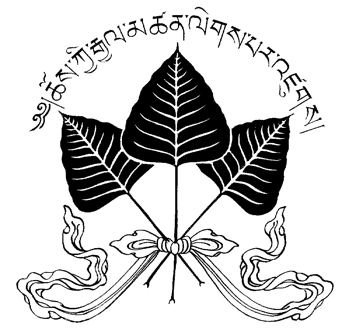 This initiation bestows the authority to meditate on Chenrezik, the embodiment of compassionate energy, and on mahamudra - the great seal - which is the true nature of mind. It is one of the most widespread meditation practices in Vajrayana Buddhism. This initiation is connected with the famous sadhana composed by the great Sakyapa master Ngorchen Konchog Lhundrup and practised at Dechen Sakya Centres. Through meditation upon Chenrezik we quickly develop compassion, and conjoined with Mahamudra we are also benefited by meditating directly on the nature of mind. For further details visit the Sakya centre website. Saraswati is famous as one of the principal wisdom deities in Vajrayana Buddhism and as a patroness of poetry and music. Thus many great masters have cultivated her meditation for the many qualities that it bestows. This year’s summer course in Sakya Changlochen Ling presents the rare opportunity to receive the full cycle of Tara initiations from the lineage of Atisha. Tara can be described as the enlightened mind appearing in a feminine form, guiding and protecting the beings who have been fortunate enough to be initiated in her practices. The course will start with the main initiation of Green Tara, which will entitle whoever wishes to attend the course to receive the remaining 21 initiations. Each of them will allow us to receive the various pacifying, increasing, magnetising and wrathful energies of the different forms of Tara and apply those in our life if we decide to engage in their practices. However the benefits of just receiving the initiations are enormous. If you can’t come for the full two-week course you can attend as many days as you wish. However, attendance on the first day (August 19th) is necessary in order to receive any further initiations during the course. This will be the first time Lama Jampa gives this collection which is bestowed only rarely in the West. * Please note that in order to receive these initiations and take part in the retreat you must have made a formal commitment to the Buddhist path through taking refuge. If you would like to do this beforehand please contact the centre by emailing bristol@dechen.org.